First we visit Tollund Put and Take . This fishing lake covers an area that was once swamp. According to the legend, it was one of the huge holes, which was created, when a selected bull from Tollundgaard fought with a snake, so big as an enormous dragon and defeated the monster. That was a great joy for the community in the village Funder, because the snake had been lying so that it had prevented the inhabitants in Funder to come to church. The story is immortalized in the Dragon Fountain at City Hall Square in Copenhagen. Today, the old swamp is a peaceful place with a rich flora and fauna. Coniferous forest provides welcome shelter and there is good opportunity for you to find your own quiet fishing spot along the 60,000 m2 lake. It's hard to break up. Next stop is the cozy Ørnsø Fiskesø . Several families are grouped by the lake. Some of them have chosen to ride out here on bikes. It can easily be done as the lake is less than 5 km from the center of Silkeborg. An elderly gentleman has rolled out to fish in his electric wheelchair. Everybody can enjoy fishing if the access conditions are right, and that they are here. Highway A15 between Aarhus and Silkeborg is extremely busy, but we turned off the stress on the main road, and just a few minutes after we are on the glorious peaceful spot at Gammel Laven Fiskesø. A great scenery and views to the Himmelbjerget, which rises sharply in the background, also fine facilities are here. We could spend many hours more at this place, but we have to leave. We head south and find ourselves in a breathtaking area with large forests and numerous streams, and here - not so far from Vrads- we find Lystrup Bæk Fiskesø. It is obviously experienced fishermen, who are angling here, and they get a good catch. We continue a short way through the preserved Salten Ådal, and after a short detour from the Marguerite route, we find Vrads Angler Lakes in the middle of this wonderful landscape. 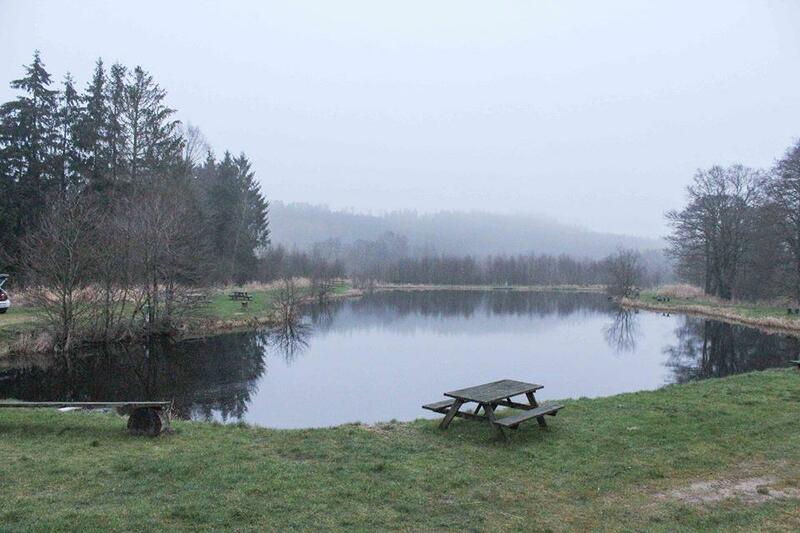 "A gem for the discerning angler", so are the two fishing lakes described. These are big words, but that's no exaggeration. We have visited a small part of the many glorious fishing lakes in the middle of Jutland,. We hope it can be an inspiration for anglers from home and abroad to set out for this amazing area and find their special "gems" among the lakes.